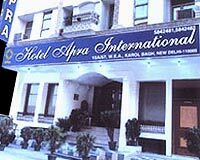 A UNIQUE WORLD OF FACILITIES AND PRIVILEGES BOON ESSENTIAL AND EXTRA ORDINARY APRA INTERNATIONAL CONVENIENTLY PLACES YOU RIGHT IN THE HUB OF NEW DELHI INDULGED WITH COMFORT AND CONVENIENCES APRA INTERNATIONAL DEFINITELY SERVERS AS A ROYAL LOCATE FOR THE BUSINESS AND HOLIDAY TRAVELLLER THE LOCATION ALSO MAKE EVERYOTHER CORNER OF DELHI EASILY ACCESSIBLE. Our hotel is near the karol bagh market, one of the busiest markets in Delhi. A short distance from the Karol Bagh metro station.